Rena Ware International of Bellevue, Wash., is recalling about 700 Nutrex pressure cookers. This recall involves Nutrex pressure cookers with model number 2153. The pressure cookers are silver colored with black handles with a blue gasket is attached on the inside of the cover. Model number 2153.DW, the month and year of production and Rena Ware are stamped on the bottom of the unit. “DONG WON” is stamped on the base of the main valve. “DWM” is stamped on the blue gasket. 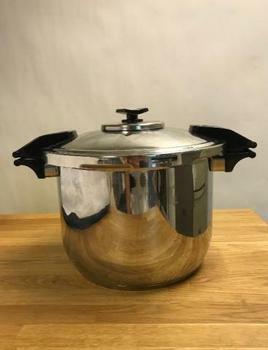 The pressure cookers, manufactured in South Korea, were sold through Rena Ware sales representatives from December 2015, through June 2018, for between $750 and $820. Consumers may contact Rena Ware toll-free at 877-736-2487 from 8 a.m. to 5 p.m. (PT) Monday through Friday, by email at CustomerService@RenaWare.com, or online at http://www.renaware.com and click on the “Consumer Notification” link at the bottom of the page for more information.